You are currently browsing articles tagged John Bailey Adger. SMYRNA. — REV. Messrs. Adger, Houston, Merrick, and Pease, who sailed from Boston in the Pa dang, Aug. 20, arrived at Smyrna, on the 25th of October, after a passage of sixty-three days. They and their wives were in good health. EXTRACTS FROM THE JOURNAL OF MR. ADGER. Mr. Adger is a native of Charlestown, S. C.
The ladies here have a poor’s society; the gentlemen support a dispensary and physician; and thus provide “a multitude of impotent folk” with medicines and medical advice. To give one’s mite to such institutions appears to me much better than to bestow it in indiscriminate charity. The Ladies’ Poor Society make it their business to visit the poor at their own houses, and they give truly a touching description of the lamentable condition of many. The gentlemen’s dispensary gave aid during the year past to not less than fifteen hundred diseased people. The Jews here hardly ever beg, although they are so poor and so much abused. They are not unwilling to engage in any menial service, however vile, for a little money; but I am told that one cannot hire the other poor to work in such a manner. Another man was killed last night. He makes the fifth whose life has been wilfully taken in this city within the month. What a sad moral condition do these murderers betray. Despite all good intentions, the following is a reprise from this date last year. But we’re on the mend and expect to have new content tomorrow. I trust you won’t mind a refresher course on this important person. Since the last meeting of Synod our oldest and most honorable member has been taken from us—the Rev. Dr. John Bailey Adger. Dr. Adger, the oldest son and third child of James Adger, a native of Ireland, and Sarah Elizabeth Ellison Adger, a native of Fairfield County, S.C., was born in Charleston [South Carolina] on the 13th of December, 1810. Preparing for the ministry, he entered the Princeton Theological Seminary in 1829, graduating there in 1833. While at Princeton Seminary, a fellow student called his attention to the work of foreign missions. After long and serious consideration, Adger was convinced that it was his duty to become a foreign missionary, and he offered himself to the American Board of Commissioners for Foreign Missions, was accepted and was assigned to Smyrna and adjacent parts of the Turkish Empire as his field, to labor especially among the Armenians. At that time the Presbyterian Church did not carry out foreign missions on its own, but worked chiefly through the American Board, which was supported jointly by Presbyterians and Congregationalists. Returning to his home in South Carolina, he spent the rest of 1833 and the first half of 1834 in preaching and delivering addresses throughout the State on the topic of foreign missions. He was ordained by Charleston Union Presbytery in the Second Presbyterian Church in Charleston, on April 16, 1834 and sailed from Boston a few months later, on the 2d of August. Rev. Adger reached Smyrna early in October, and at once began his missionary work, which continued with little intermission for twelve years. His industry was untiring. As soon as possible he began to preach in the Armenian tongue; but his chief work was through the press. The Bible had been translated into Armenian centuries ago; but the ancient Armenian had become an unknown tongue to the people of this country. Therefore the first thing to be done was to translate into modern Armenian, so that all could read the Scriptures for themselves. This task he undertook as soon as possible, with skilled assistants. The translation of the New Testament and the Psalms which he thus prepared, was printed by the British and Foreign Bible Society. Some years ago, more than 300,000 copies of this translation of the New Testament had been circulated among the Armenians in Asia Minor and elsewhere. He also translated and published many other works, as the chief and most valuable of which, though small in size, may be mentioned the Shorter Catechism, and C.C. Jones’s Catechism. By the year 1846, incessant writing and proof-reading of the trying Armenian letters had so injured Dr. Adger’s eyes that rest was imperatively necessary. Accordingly, for this and other reasons, he came to America, expecting as soon as practicable to return to his work in Asia Minor. But this was not to be. As the time time approached for his return, circumstances arose which led to his final withdrawal from work under the American Board. Dr. Adger never returned to Smyrna, but remained in South Carolina the remainder of his life, serving notably as a professor of church history at the Columbia Theological Seminary, from 1856 until retirement in 1874. Along with James Henley Thornwell, Dr. Adger had been one of the chief architects of the Book of Church Order that was finally adopted by the Southern Presbyterian Church in 1879. In retirement, Adger composed a lengthy autobiography, My Life and Times, which stands to this day as a fitting cap to a long and illustrious ministry. The Rev. Dr. John Bailey Adger died on this day, January 3rd, in 1899. My Life and Times, originally published in 1899 but solely for private distribution, was reprinted in 2007 by Tentmaker Publications in England. The reprint includes a new preface and a biographical sketch by Dr. C.N. Willborn, pastor of the Covenant Presbyterian Church in Oakridge, TN, plus an added appendix—a bibliography of Dr. Adger’s published works. In this convenient age of the Internet, the original edition of My Life and Times can also be found on the Web here. The full, unedited text of this Memorial from the Synod of South Carolina is available on request. Words to Live By: We see in Adger a life well spent, even exhausted, in the Lord’s service—a life lived in obedience to the words of Scripture: “Whatever you do, work heartily, as for the Lord and not for men, knowing that from the Lord you will receive the inheritance as your reward. You are serving the Lord Christ.” (Col. 3:23-24, ESV). May that be our purpose and goal in life as well, to live unreservedly for the Lord our Savior. in 1898, Robert Lewis Dabney died at his home in Victoria, Texas, at the age of 77. Note: Our Through the Scriptures and Through the Standards section will now be replaced by the RSS feed which appears in the column on the right hand side of the page. John Bailey Adger, D.D., died in Pendleton, South Carolina, on the 3d of January in the 89th year of his age. Dr. Adger was born of Scotch-Irish parentage in Charleston, S.C., December 13, 1810. He graduated when 18 years of age at Union College, Schenectady, N.Y., and at Princeton Theological Seminary in 1833, of which, at the time of his death, he had been for some time the senior surviving alumnus. Shortly after his ordination by the Charleston Union Presbytery in 1834, he went as a missionary to the Armenians, under appointment of the American Board of Commissioners for Foreign Missions, and served in this work for twelve years at Constantinople and Smyrna, until the failure of his eyes and other circumstances compelled hisi withdrawal from the foreign field. During his missionary service he translated into Armenian the New Testament, Pilgrim’s Progress, the Shorter Catechism, and other books, which translations are still in use among that people. Upon the withdrawal, in 1856, of Dr. Palmer from the Chair of Ecclesiastical History and Church Polity in the Columbia Theological Seminary, Dr. Adger was elected his successor, and filled that position with great zeal and ability for seventeen years. 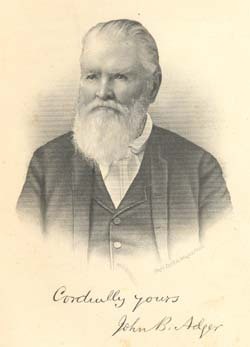 After his retirement in 1874, although he had then reached the age of 64, he entered with energy and vigor upon the pastoral work in his own Presbytery of South Carolina, which he continued until, having attained the age of 83, he was reluctantly constrained, by physical infirmities, to give up the public preaching of the Gospel. At this advanced age, and amid these hindering infirmities, with courage and energy, he undertook what was perhaps the greatest task of his life, the writing of a large book, which he called “My Life and Times.” His life had been a long one, the times through which he had passed, eventful in Church and State; and he undertook to write a history and discussion of the various questions he had to meet and help to solve. With the assistance of a devoted daughter, and such other help as he could procure, he gathered up the facts, studied out the questions, and dictated chapter after chapter of his book. His mind, still clear and vigorous, and his body wonderfully strong and active, he labored systematically and diligently for several years at this work. And almost as soon as the last chapter was finished, the last page written, and the valiant servant of God had laid down his fruitful pen, the Master called him to the everlasting rest. Dr. Adger’s magnum opus, My Life and Times, is a classic and was reprinted just a few years ago by the English publisher, Tentmaker.